As you can tell, this email is going to go all over the place. So many things to talk about in the Spring and so little time. We have some sad news to announce. I have thought long and hard on whether this was the appropriate venue to share this with you. I just didn’t know if I wanted this information to get out into email land, but I hope that you will keep it private because something happened that I just didn’t see coming. Petunia quit. She quit without notice. For all of you who don’t know Petunia, the cat, she’s quite famous around here. Now, I’ve had people quit before, but I always wanted them to quit for the right reasons, not the wrong reasons. I’ve always felt that if I can sit down and talk to somebody, I can resolve issues and we can all move forward. But Petunia did not sit down with me to talk to me about her issues or needs. She just quit. Her absence has become so apparent that people ask about her every day. “She’s around.”, I would say, internalizing the fact that I haven’t seen her for days. Well, I figured it out. Petunia quit High-Hand and went to work for the Tin Thimble. I was quite irritated. I talked to the people at Tin Thimble about their hiring practices. Hiring each other’s employees in the same building makes bad politics. Right? 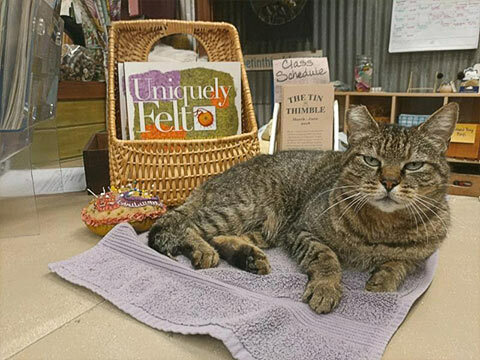 So, for all you wondering where Petunia is, she works at Tin Thimble now. I don’t get it. I’ve given her everything she needs. A roof over her head, food, a sanitary bathroom and her choice of whatever box she wants to sleep in. Well, I overlooked it. I guess if you’re a cat who lays around all day and does absolutely nothing, a towel is probably all it takes. Yes, you got it. Tin Thimble lured her away with the offer of a color coordinated towel. Petunia, I’m glad you found a new opportunity and I hope it works out well. If they ever take your towel away, know that you’re always welcomed back at High Hand. Speaking of Petunia, our petunia baskets are beautiful. 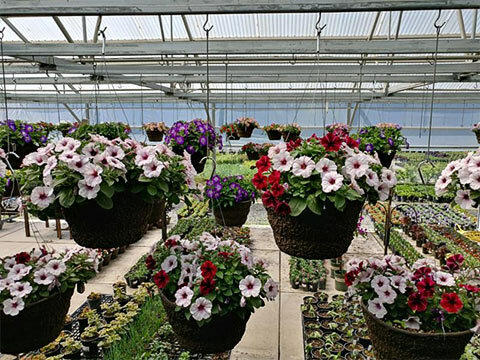 Our petunia machine is manufacturing petunia baskets with perfect results. We call these Halloween baskets. With loving care, these baskets can survive all the way into October. The big box stores’ flower baskets I call End of School baskets or Fourth of July baskets. They’re grown differently. Generally in smaller pots and you will have to work very hard to make them survive through Fourth of July. If you’re lucky, maybe you can name your basket a Back to School basket. Our baskets are big and beautiful and available. 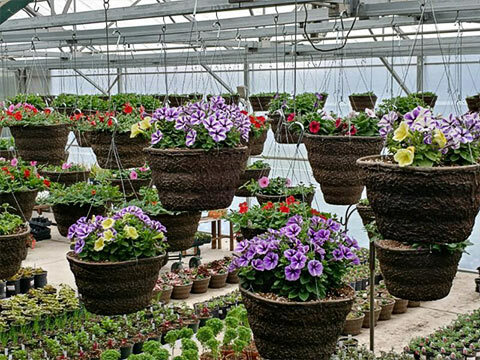 A few tips and tricks for the baskets include monthly feeding with a liquid fertilizer and cutting back hard when they get too leggy. Scary, but trust us. They’ll flush out and bloom again with a week or so. Really. Come and get one. They go fast. Yes, I thought all this was going to happen. So I went online and I voted for myself. At first, it felt kind of weird, voting for our nursery, but then I thought, “Wait a minute, if politicians can vote for themselves, why can’t I? Am I exempt from voting because it’s for our nursery?” I think not. So with a big breath, I went online to vote. As I was typing in my email and creating my password, blah, blah, blah, and, yes, giving them my zip code so they know where I live, I was fearful that I had given up my goods. All of my fear was erased as I went through the prompts for voting for High-Hand Nursery, I found a box that said, “Click here and we will not contact you.” Perfect. My fear melted away and now I was voting with confidence. So, if you would do me a favor (by the way it only took me about 55 seconds), would you vote for us by clicking here? We will love you for it. 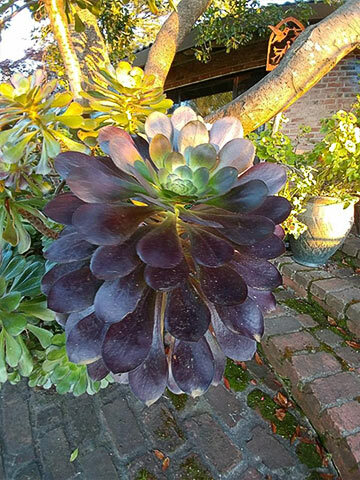 Who says aeoniums can’t be grown in Zone 9? 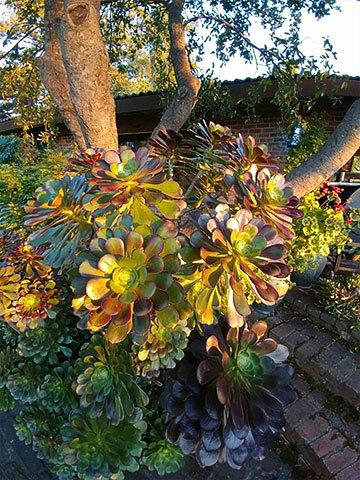 Check out my aeoniums at Maple Rock. You want to check out my peonies? 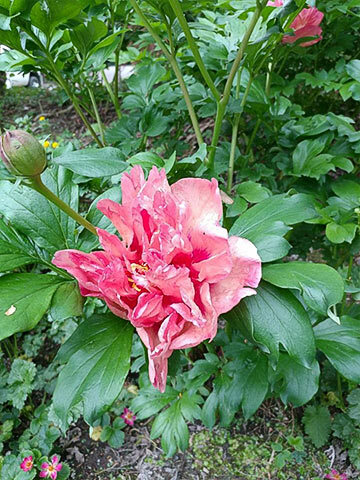 My peony. I have a lot of peonies at Maple Rock. Do you mind if I just show off for a minute? Every year like clockwork the peonies burst out of the ground. You’re probably still struggling with my subject line, Petunia, Peonies and Tomatoes. Here’s where it all comes together as it always does if you’ve read my emails. Peonies have big heavy buds, same as tomatoes with their big heavy fruit. How do delicate plants produce jillions of buds and pounds of fruit? What do our bones in our bodies need to grow strong? Anybody? Anybody? Bueller? Well, calcium. I actually did fertilize the peonies with tomato food. Hah! My subject line makes sense now. So clever. 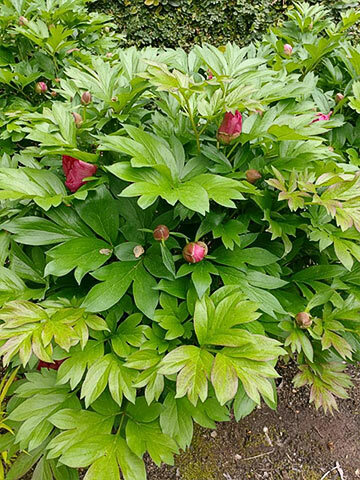 As they burst every year, I start clicking off the days to Bloomtastic and I start to wonder, “Will this be the year?” Will this be the year that the peonies and Bloomtastic actually meet on the same day? It’s going to be close. The cold weather and the rain in April put a halt to the bursting. Join us at Bloomtastic and see the conclusion to the peony and Bloomtastic race. Who will win? I have no idea. Or will it simply just be the perfect photofinish? 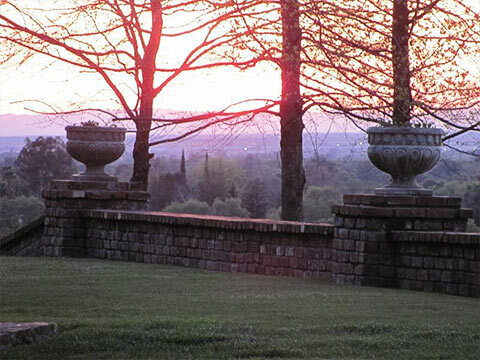 Stroll the gardens with a mimosa, enjoy live music, the trains will be running and lunch can be purchased. Parking is free. Tickets can be purchased at High-Hand Nursery or online by clicking here. It is not often that we open up the garden so don’t miss the amazing Spring at Maple Rock Gardens. 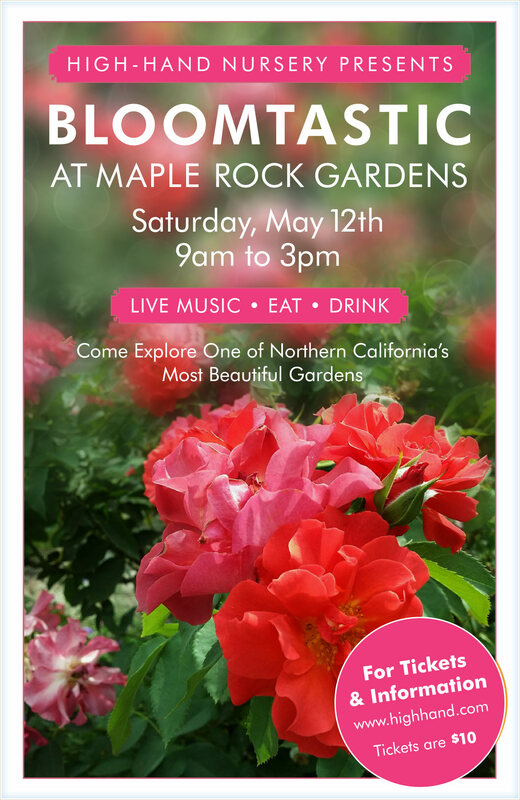 May 12th | Bloomtastic at Maple Rock Gardens from 9-3. Join us for the race of Bloomtastic versus peonies. Juneish | Succulent days with Robin, Sunset Magazine’s succulent guru. The time will be announced in the coming week. Septemberish | Train days will come back. There will be flowers to pick and perhaps even tomatoes you can harvest. Fun, isn’t it? We’ll be adding more things and we are extending the succulent class to a third class. If you missed the first two, check online and join us. Please vote for us. It might be a photo finish. We could certainly use your help. High-Hand Nursery equals happy gardening. P.S. Let’s see if you’ve made it all the way to the bottom of the email. 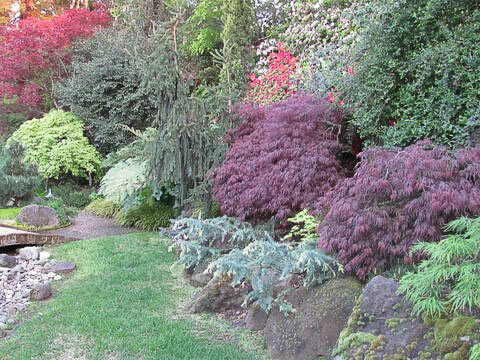 Full sun Seiryu Japanese Maples, regularly $195.00 will be $150.00 through Sunday, April 29th. There you go. Forty-five bucks off a great tree. They’re large and beautiful. Trust me. Or don’t. At least come in and see for yourself. I’m sorry, but I think Nature is simply amazing. Being in the green industry, aka High-Hand Nursery, you would think that after awhile we at the nursery would get a little bit jaded with all the flowers around us. When I was younger I used to make donuts. You would think that would be every teenager’s dream job. But after going home smelling like a glazed donut, I found myself cured of my donut habit. I stopped eating donuts within weeks. Okay, that’s kind of a big fat lie. I still enjoyed a warm raised glazed donut fresh from the cooker. But, working in the donut shop I really did get sick of all the donuts, greatly reducing consumption. I’m kind of a plant guy. I make my living with plants. So, it’s safe to say that being in the nursery industry for over 30 years I can kind of take Nature for granted sometimes. Spring is the time of year that it all comes alive again and the amazement of Nature starts its trek over again with the beginning of the seasons. Just an ordinary silly pine. I don’t wear anything other than my hat that identifies me as anybody at High-Hand Nursery. So, most people don’t know me from squat. Perfect. I get to walk around and be a fly on the wall and load an occasional bag of dirt onto the back of a car. I get to hear comments unfiltered. I’m just the average Joe standing next to you. I happened to be standing next to this basic ordinary pine in the nursery when a couple walked up to it and made a comment that kind of made me chuckle. 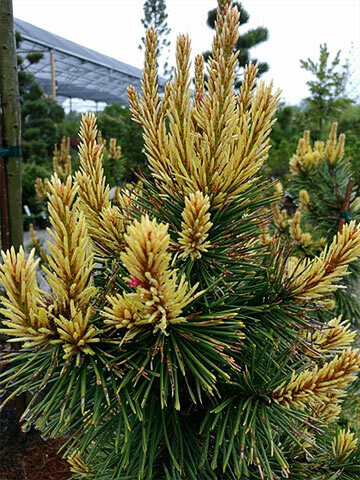 The woman said to the man, “With all the beautiful Japanese maples in the nursery why would they plant this silly pine here?” I almost blew my cover to explain to them this “silly little pine” is actually an amazing act of Nature and demonstrates how beautiful something can be. 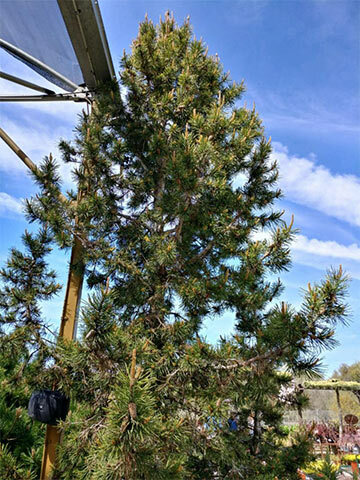 The pine was discovered in the high regions of Colorado in the Spring. When they went back to find the pine again, sadly it was lost. The pine was lost amongst all the other foliage. They thought they had the right location but all they saw was an ordinary pine. So, they thought, “Well it was Spring the last time we were here, so maybe we’ll wait until Spring and come back again to see if we can find it.” They went back and lo and behold they found the amazing pine from a year before. This pine puts on quite a Spring show. It will sit there all summer looking just ordinary. Blah, blah, blah. And then, boom! The Spring push bursts from the tips finishing in a vibrant, neon yellow with little red cones. Pretty cool, huh? Those folks had no clue that they were talking about one of my children in the nursery. ‘Taylor’s Sunburst’, appropriately named. It’s safe to say that the man who discovered the tree had the name of Taylor. So, if you visit High-Hand Nursery in the coming days, ask where the Sunburst is and be amazed by its beauty. It’s safe to say we have the largest one in California. Amazing Nature. A few days ago I was walking by that same wall. I actually walked by it and stopped. Turning around I needed to verify the image that was stuck in my head. 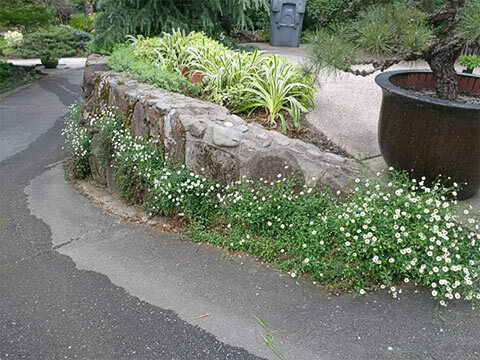 That little white flower and leaf had turned into something amazing on the side of a rock wall. 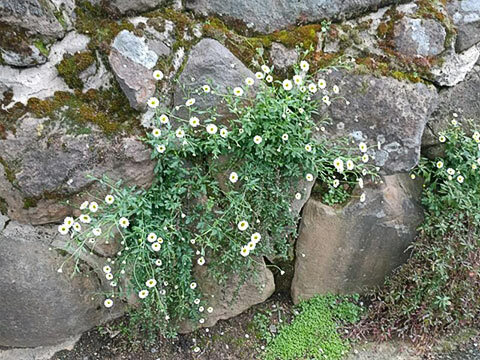 I introduce to you Miss Santa Barbara Daisy, growing out of a rock at Maple Rock Gardens. Amazing nature. Do you want to come see this cliffhanger with your very own eyes? Join us May 12th at Maple Rock Gardens. 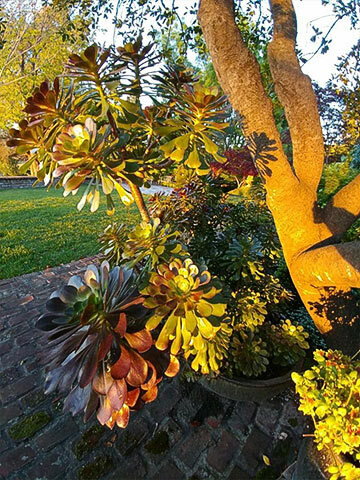 Take a tour of Maple Rock Gardens. Parking is free. Tickets can be purchased at High-Hand Nursery or online by clicking here. It is not often that we open up the garden so don’t miss the amazing Spring at Maple Rock Gardens. We really don’t have an assembly line that produces flower baskets. That would be silly. We have Maria and Olivia and the Willy Wonka flower basket machine. Visit our greenhouse at High-Hand Nursery and see our amazing machine and you might catch a glimpse of the elusive Olivia or Maria. They’re kind of shy like the Oompa Loompas. Pick up your own amazingly fresh flower basket. With the arrival of the succulents comes our succulent wreath class. The class will include all the supplies you need, light bites and, yes, Mimosas. 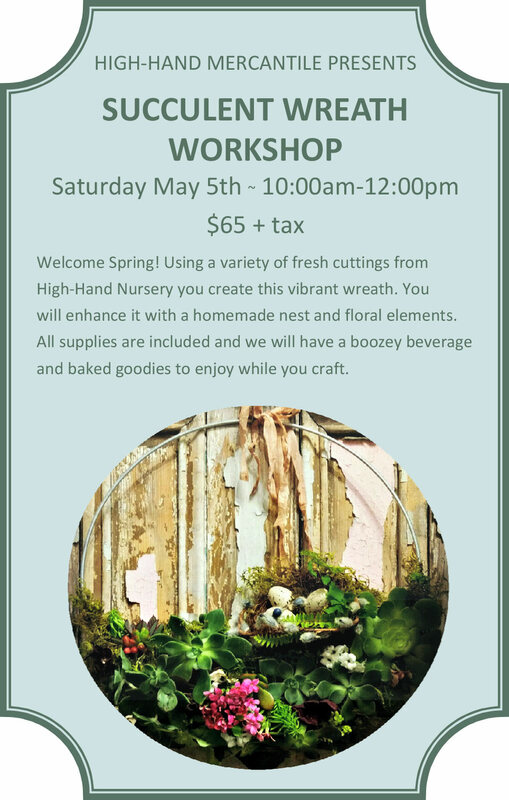 Class sign ups can be purchased by clicking here or come in to High-Hand Mercantile store and see not-so-crazy Dori (she’s actually crazy only half the time) and get the lowdown and reserve your spot. I’m always amazed at the explosive power Nature has. In the not so far past, it rained. The next day the flowers came out and then the next day happy butterflies exploded. You will never know how amazing Nature’s butterflies are until you actually get to hear the music their wings make as they flutter around the flowers. I was amazed at the sound I was hearing. This beautiful music. Why haven’t I heard this before? After all, I saw a leprechaun as a little child. I even built a leprechaun house and brought it food. He was my friend. But I think in this case the butterflies did not realize I was there and as soon as they discovered me, the music just stopped. I’m trying to find one of those wildlife cameras you can set out in the garden with a recording device so I can hear the rest of the song. May 12th, Maple Rock Gardens from 9-3. I’m sure the bashful butterflies will still be there. What’s coming up at Maple Rock after Bloomtastic this year? Here you go. Here’s the answer. Dates will be announced as Mother Nature gives us the information. Follow us online or Facebook, or Instagram. Yada, yada, you know the drill. Get your flower baskets while they last. Maria and Olivia have been working on them all Winter. Spring has sprung and with the springing of Spring brings with it High-Hand’s annual Bloomtastic at Maple Rock Gardens. Have you ever been to Maple Rock? No? Silly rabbit. You need to go. Here’s what you’ll miss if you don’t. You’ll miss gorgeous Japanese Maples. 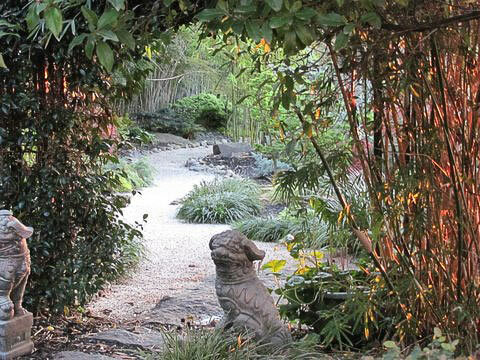 You’ll miss a stroll through the Japanese Garden. 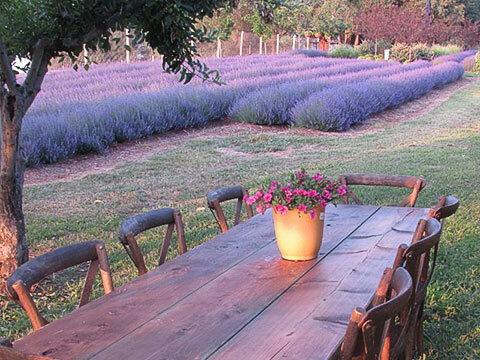 You actually will miss the lavender, even if you come. Why? It won’t be in bloom. But fear not, we will have a lavender pop-up event when Nature allows us to. 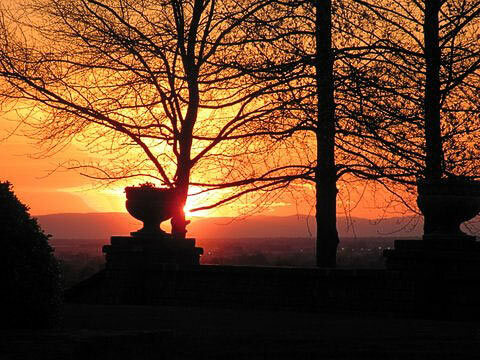 Regardless if you come or not, you will miss the sunset. Sorry. Bloomtastic is from 9am to 3pm. The sunset is roughly 8pm. You can do the math. So sorry. Tickets can be purchased at High-Hand Nursery or online by clicking here. Nature is always in control. I think by now we’ve figured that out. And Nature controls Bloomtastic. It’s her show. She keeps us on our toes every year. Bloomtastic. Don’t miss it. We’ll see you May 12th, 9am to 3pm. What’s coming to Maple Rock after Bloomtastic, you ask? Here’s a few things we’re noodling over. Actually, we can noodle all we want. We’re just waiting for Mother Nature to tell us when all these things will happen. There will be announcements via our email newsletter. If you need to sign up, you can do so by clicking here. Can’t wait for Bloomtastic? Come to High-Hand this Saturday and Sunday. 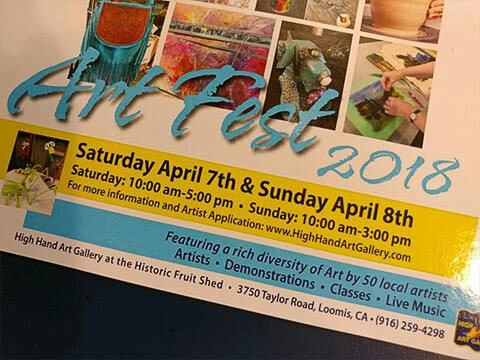 Art Fest 2018 has arrived this weekend. Join High Hand Art Gallery and step into the world and rich diversity of the arts. Artist demonstrations, classes and live music. Don’t miss Art Fest 2018. Spring has sprung at High-Hand Nursery. Did you know that we grow right here in our High-Hand greenhouse unique plants and flowers? I didn’t stage this picture. 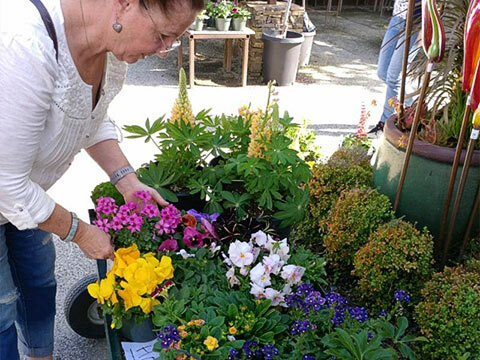 This is a real lady filling up a real nursery cart with extraordinary High-Hand flowers. See you at High-Hand Nursery this weekend. Make sure you don’t miss out on the best that High-Hand has to offer.